At the risk of confusing the reader with multiple outings in Belgium, I am going to pause descriptions of winter retreat beer tastings in the Ardennes -- of which there is so far only one anyway -- and move directly to the present to discuss today’s hike out in the wilds of East Flanders. 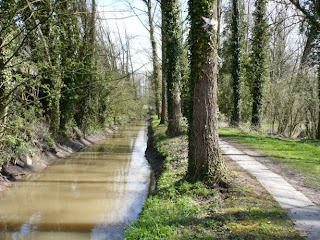 We took a morning train from Brussels out to the village of Munkzwalm, from which we walked along the Zwalm River for a few hours. It’s a lovely hike, perfect for the girls: short, no hills, with lots of things to see and enough places to stop for a break along the way. The day was ideal -- sunny and about 14C, which is about as good as you can expect here this time of year -- and the path along river wasn’t nearly as muddy as I feared. There are a few picturesque mills along the route, some of which now house pubs, a couple of which were even open. 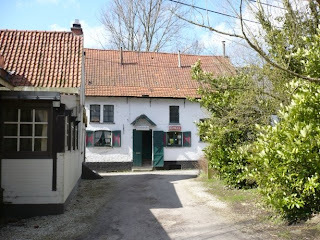 The first we walked into was Ijzerkotmolen, a fairly dusty and nearly empty old place, and we took a table by the window over the spot where the water once turned the wheel. I ordered an Ename Dubbel, clearly a local favourite, as it’s made by the Roman Brewery in Oudenaarde just down the road. I’ve tried Ename Tripel before, and I thought it was a pretty fine strong blond ale, so I had great hopes for the dubbel. I wasn’t disappointed. It pours thick and looks dark and rich, with a sticky beige head like a Westvleteren 8 or a Achel Brune Extra. It’s not as heavy and complicated as either of those two brands from my list of top ten Belgian beers, however. Nice review..I'm a big fan of the Roman brewery..it's also the oldest family brewery in the world.My favorite output is the Ename cuvée 974.. Try the Adriaen Brouwer Finest Dark...if you haven't already..it's their latest brew. 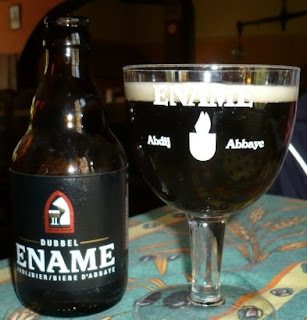 I drunk "Ename Dubbel" Oooh how good was that beer. Later on after surfing on internet I saw your page. Your quite right. I'm not alone in my feelings. Thank You for your trips and tastings !!! Good greetings and please go on !